Ruth Arlow was elected to the ELS Committee in March 2018. She is currently Chancellor of the Dioceses of Norwich and Salisbury, having served as Deputy Chancellor in the Dioceses of Chichester, Norwich and Oxford. She is a member of the Standing Committee of the Ecclesiastical Judges Association and she serves the National Church on the Legal Advisory Commission and as a Legal Chair of the Clergy Discipline Tribunal. She has been Case Notes Editor for the Ecclesiastical Law Journal since 2001. “I am often met with blank looks or, at best, polite smiles when I explain what I do for a living. Ecclesiastical law is not an area of law with which many are familiar, and yet it touches the lives of a surprising number of us. I came rather late to an understanding that rules and good governance are vital to the proper flourishing God’s church – to an efficiency of operation and a sense of order and fairness. Such things nurture rather than diminish the sharing of the Gospel. “The move from 1 The Sanctuary to Southwark DAC has allowed me to continue to work within ecclesiastical law, specialising in the Faculty Jurisdiction, as well as maintain a broader view of associated areas of law both ecclesiastical and secular. Both roles have shown me how the law is the ‘servant’ not the ‘master’ of the church, and that it should be understood and applied pragmatically. It fits within a practical, pastoral and missional context, and is both adapting and (in the right sense) unchanging. “Ecclesiastical law is about identity and relationships: the identity of the church and the relationships between those in the church. What we mean by ecclesiastical law is also the law of the church (both statute-law and case-law) and the remainder of this country’s law as it applies to the church. 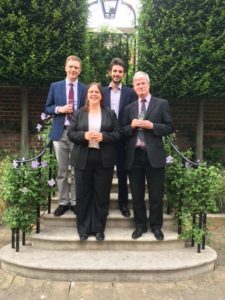 21/05/2019 Sarah Horsman on "The CDM – a Sideways Look"
03/07/2019 Professor Norman Doe on "The unifying effect of Christian Law for Ecumenism"
16/07/2019 Bishop Nick Baines on "The Function of Ecclesiastical Law in Effective Parochial Ministry"
06/11/2019 Charles George QC on "Do we still need the Faculty System?" Ecclesiastical Law Society is a registered Charity No. : 296553. 1. The Sanctuary, London, SW1P 3JT.